Opening Reception: Sunday, August 19, 2018 2:00 to 4:00 pm. Free and open to the public with admission to SDBG. 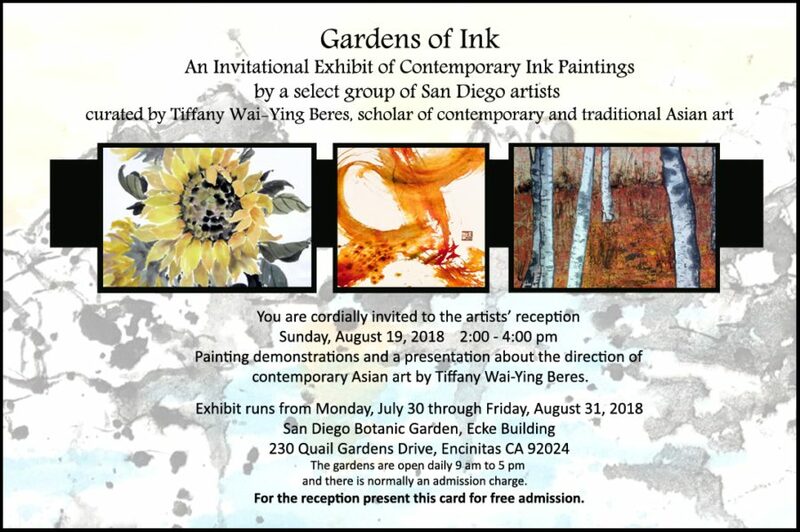 Event Details: This is an invitational exhibit of Contemporary Ink Painting curated by Tiffany Wai-Ying Beres, a scholar of contemporary and traditional Asian art. The reception will include painting demonstrations, a presentation by Tiffany Wai-Ying Beres on the direction of contemporary ink painting, refreshments, and more. Art will be for sale. Gardens are places to explore the relationship between nature, culture and place. Over the centuries, Chinese, Japanese and Korean poets and artists have imbued a variety of plants and animals with auspicious meanings and scholarly virtues. Paintings and texts are inspired by the resilience and beauty of nature's flora and fauna. This exhibition presents a selection of contemporary ink paintings inspired by the evocative and emotive qualities of nature. Portia will have five paintings in this show.